Villager in Central Kalimantan building box dam across canal. Photo taken for exhibition on GAMBUT at COP-22 by photojournalist Kadir van Lohuizen (c). Box dam with sluice for passing through in Central Kalimantan. These dams have been used to block canals, but are known to require lots of upkeep and are subject to destruction by illegal loggers and others, and are not the preferred method for canal blocking. Photo taken as part of an exhibition on GAMBUT for COP-22. Photo by Kadir van Lohuizen (c). Drained and cleared land in Central Kalimantan, ready for planting with palm oil. Photo was taken as part of an exhibition on GAMBUT for COP-22. Photo by Kadir van Lohuizen (c). Villagers setting up and checking fish nets in a river in Central Kalimantan. Because of canals draining the land, many of these rivers, and thus these communities are threatened by low water levels. Photo of Kahayan bridge in Palangka Raya during the peak of the fires in September 2015. This "haze" filled the air for months, causing widespread sickness, slow crop growth, and closed businesses and schools. Photo by GAMBUT staff Sherry Panggabean. During the dry season, water levels get so low that some canals dry up entirely, like this one in Central Kalimantan. Its these low water levels that cause peat to be so dry it burns, and the only solution is to block canals so water remains in the peat. Photo taken as part of an exhibition on GAMBUT for COP-22. Photo copyright Kadir van Lohuizen. Blocked canal in Central Kalimantan where nature is taking over and filling in. Ideally this would happen to most canals, as only this sort of total blockage and regrowth will bring the land back to its natural, wet, fire-free state. Photo taken as part of an exhibition on GAMBUT for COP-22. Photo copyright Kadir van Lohuiznen. 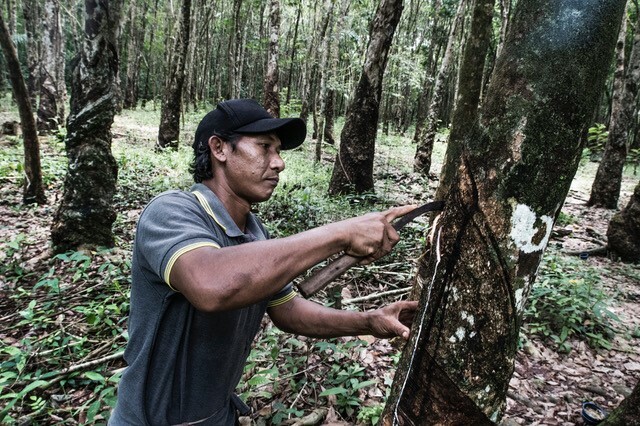 Man tapping rubber tree in Central Kalimantan. Rubber plantations large and small dot the countryside and along with palm oil and pulp, are another driver of peat draining and fires in this fire-prone province. Photo taken as part of an exhibition on GAMBUT for COP-22. Photo copyright Kadir van Lohuizen. Girl standing in toxic "haze" produced by peat fires during the 2015 fire season in Central Kalimantan. This haze contain tiny particles and carcinogens that penetrate most paper masks and pass through the lungs, into the bloodstream, causing widespread cardiovascular sickness, and worse. Photo by GAMBUT staff Endang Hariyadi. Boat on canal in Central Kalimantan near a raft of logs collected through illegal logging. These canals, which were built to drain the land, need to be blocked in order to rehabilitate and rewet the peat. 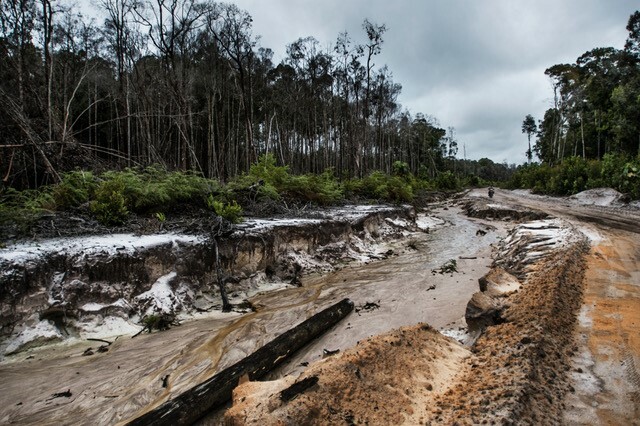 Unfortunately, many of the canals are used for illegal logging, and unless they are blocked aggressively, loggers tear down dams so they can continue to use them for transport of illegal goods. Photo taken as part of exhibition on GAMBUT for COP-22, by Kadir van Lohuizen (c). Recently burnt peatland in Kalimantan. Peat is a hydrocarbon, like coal, and once it ignites, it burns not only on the surface, but also deep into the ground, making these fires nearly impossible to put out without the deluge of water that comes when the rainy season begins. Burning peat obscures a setting sun, Dumai district, Riau, September 2016. Photo by GAMBUT staff Bima Mahendrata. Villagers preparing, clearing and replanting burned peatland in Central Kalimantan. Peat soil is very acidic and not suitable for most crops without significant effort and inputs in the form of fertilizers. Peat is however suitable for growing of native peat species (paludiculture) like rattan, sago, jelutung (latex) and many others. Many communities are beginning to explore paludiculture as a sustainable alternative to traditional crops. Photo taken as part of exhibition on GAMBUT at COP-22, by Kadir van Lohuizen (c).